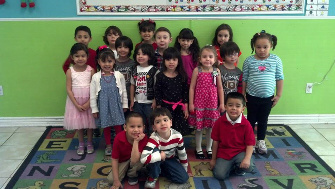 Wee Wisdom is one of the longest established daycares in El Paso, TX. Since 1976 thousands of parents have trusted us with their children. We provide a positive, caring and fun environment that is dedicated to preparing your child to learn. We are conveniently located in the 79936 and 79935 area and we do accept CCS. ​The goal of Wee Wisdom Daycare is to have its students develop important academic fundamentals and acquire, from success, a sense of personal worth and the ability to achieve their total potential. As a private child care facility and learning center, we have the flexibility to bring together time tested educational philosophies that work while adding new programs that enhance those philosophies. Our day care staff and learning curriculum engage the student to think more effectively in developing effective language and cognitive skills. Thus they can integrate these skills to accomplish making the transition to actually doing what they know should be done from simply knowing what to do. ​for a life of learning. Read about our standard policies and how we structure our operation to make sure your child is safe. Check out some fun pictures and catch a glimpse of our facility. 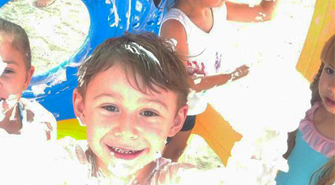 We strive to make our daycare a fun and engaging place. There are many child care options in El Paso. Here's what parents say about us. 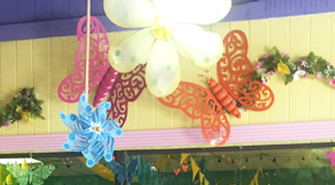 What is the difference between a daycare and learning center? A learning center, like Wee Wisdom, has a primary focus on education. A daycare simply cares for your child at the times of the day when you are not able to. We place a strong emphasis on education while providing the utmost care for your child. Our founder and director, Claudia Labrado, has a background in education. We take great great pride in preparing your child with a strong academic foundation while providing the love, care and attention they deserve. Quality education is important for inspiring children. Quality education gives children the foundation to meet the challenges of new opportunities and succeed in obtaining them. Educating students in technology cannot be more important today. However in the first years of a child’s education, the Three R’s (reading, writing, and arithmetic) has a strong and vital place. Personalized education is a must in instructing the young. Creative thinking is robust in a young child and can enhance the learning experience especially when directed while learning a particular concept. Wee Wisdom’s teachers understand this concept. It's not easy finding the right care for your little one. There are over 200 child care facilities in the El Paso area. How do you know which to pick? Who will provide the care your child deserves? Will they prepare your child for school? Here are some important steps to take before making your choice. Interview facilities over the phone to make sure they meet your basic requirements then schedule a visit. This basic phone screening will save you time. It is important to do your research. Ask around, check references and look for testimonials. Make sure you are satisfied that things check out. 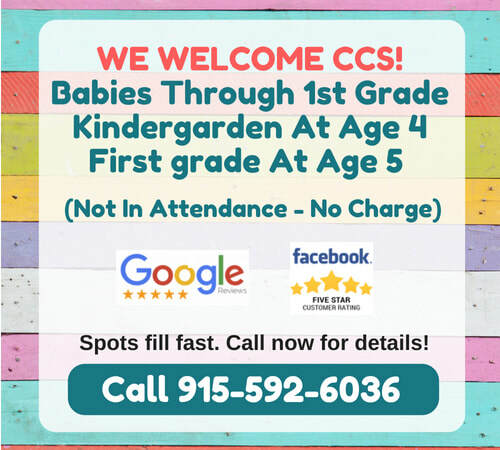 Take a tour of the child care facility and meet with the director. Ask questions and get a feel for the environment. Trust your instincts. While the staff may be busy, it is important that the day care director takes the time to listen and thoroughly answer questions. Stop by without an appointment and see what it's like when the staff isn't prepared for your visit. Things to ask a day care to help you make the right choice. What are your hours? What time can I drop off and pick up my child? Make sure the hours fit the times you need for your schedule. Can I come in for a tour and interview the director? There should be no hesitation to schedule a day and time. What are the costs? Is there an application fee and what is the weekly or monthly fee? Are there prepay discounts? Get the full details on the costs and ensure that the daycare is within your budget. Are there half day and full day options? Different facilities offer different options. Are you licensed and in good standing with the state of Texas? Child care centers in Texas are required to be licensed. Is there are certain number of children you care for at once per adult? Are there limits for babies cared for at the same time and toddlers? The state has limits on the number of children per supervising adult. Sometimes the facility will also have further limits. What experience do your director and staff have? How long have you been in business? It is wise to make sure the child care provider has experience and have a good track record. Ideally they will have been in business for many years. Does the director have formal training in childhood education? If you are looking for your child to gain some educational value out of daycare then it is important to ask about formal training. Is your staff trained in CPR and first aid? This is required by the state of Texas. Can you provide references and testimonials? Again, there should be no hesitation in providing this. What is your philosophy regarding child care, discipline, early childhood education, feeding and soothing? Be sure the philosophy aligns with yours. ​Can parents drop in whenever they like, unannounced? What level of involvement is required from the parents? Is there a way for parents to participate? If a child is sick how is that handled? What kinds of meals are the children fed? Do you do background checks and check references of the staff? Children come to us from all over El Paso. Having been established for so many years has blessed us with many referrals. Many of our children come from the 79936 and 79935 zip codes. Others come from the following areas: Socorro, Horizon City, Clint, Northeast, West Side, Lower Valley, Upper Valley, Central, 79934, 79930, 79927, 79925, 79924, 79922, 79920, 79915, 79912, 79911, 79908, 79907, 79906, 79905, 79904, 79903, 79902 and 79901. ﻿Having been in operation since 1976, we've helped care for many children throughout the years and carry an A+ Better Business Bureau rating. We understand that it is difficult to leave your child while you go to work. The best way to feel comfortable is to schedule a visit and meet with us. Ask us questions and get a feel for our facility. We are confident you will like what you see.